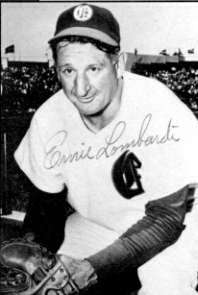 The son of an immigrant Italian grocer, Ernie Lombardi was born in Oakland, near the city's first fenced ballpark at 13th and Center streets. As a boy, he became proficient at bocce ball, as well as baseball. His teammates like to call him "Botch" instead of the nickname "Schnoz" coined by the media. Ernie has had a long career in America's National sport and has achieved the distinction of a 17-year man in the Leagues. . . twice leading the National League in batting. A long ball hitter, he uses an unusual interlocking batting grip, wrapping the little finger of his right hand over the index finger of his left hand like a golfer. Lom played with the Oaks in 1927, the last time the team took the Pacific Coast League flag, and left in 1930 to join the Brooklyn Dodgers. Before leaving, though, he managed to hit a long long ball over the old center field scoreboard at Oaks Park..
From Brooklyn he went to Cincinnati in 1932, where he batted over .300 in seven of the next 10 years, including a batting championship in 1938, when he hit .342. He went to the Boston Braves in 1942, where he won his second title with a .330 average. He next went to the New York Giants for five years. 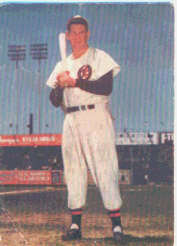 He returned to the Coast League in 1948, where he started the season with the Sacramento Solons. While playing for the Solons, he blasted a hanging curve ball thrown by Oaks' pitcher Lloyd Hittle that was still rising as it cleared the left field fence at Sacramento's Edmonds Field. It landed in the parking lot 578 feet from home plate. He came to the Oaks from Sacramento on May 20, 1948. Later in the same season, he hit the longest homerun in the history of the Emeryville park. Lombardi is a tremendous line-drive hitter but slow afoot. In 2,054 games over 23 years, he stole only 14 bases. 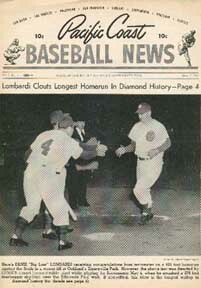 However, to the fans' delight, on "Ernie Lombardi Night" he actually stole second base. The opposition may have liked him as much as everyone else does.